Everytime I wear makeup for a special occasion, I have to remember to take it off before going to bed. Some girls simply wash their face, but instead I first like to use makeup remover wipes and afterwards wash my face. Wipes are so convenient to use because they really take the dirt and all other particles off my face, plus, while doing your makeup, if you mess up you can easily wipe it off. Not only that, wipes are cheap, easy to use, and disposable! I don’t really have second thoughts when purchasing my makeup wipes because it’s a product I tend to use often and it’s necessary for my sensitive skin. Wipes are very practical, there are many different kinds of wipes for everyone to use but there is a huge problem with that. The problem is that these are the products that are causing great damage to our environment, the products we blindly buy and just consume without putting much thought into it. We don’t consider where these wet wipes come from, how much energy they wasted, and what their life cycle is like. For our group project me and my partners decided to explore in depth the raw materials, embodied energy, and waste emissions for disposable wipes. I was assigned to discovered what are the raw materials being used and how many more raw materials are added throughout the life cycle of wipes. The most common type of fibers that are used for the production of personal wipes are cellulose fibers: cotton, wood pulp, and viscose rayon (Love Wipes As Much As We DO?). Each fiber goes through a production process to become nonwoven fabrics. There are also synthetic oils like polyester and polypropylene added to producing wipes (Love Wipes As Much As We DO?, Wiertz, Pierre.). In addition chemicals are added to form different wipes for various uses. I will be talking glycol, phenoxyethanol, glycerin; the most popular chemicals that are typically added for hygiene/personal care (“Makeup Remover Cleansing Towelettes.” , “Nu-Pore Makeup Remover Towelettes.”). Disposable wipes are made of nonwoven fabric, which is are continuous filaments or fiber webs mechanically bonded by different techniques (Hatch, Kathryn L.). The process that is specifically used for wipes is called dry-laid; this process uses air to mix fibers and deposit them randomly into a web. Layers of fibers contain randomly parallel fibers with the fiber positioning resulting from deposition from an air stream; the bonding occurs with an adhesive or heat (Hatch, Kathryn L.). Cotton comes from plants and is harvest in tropical and subtropical regions around the world, it goes through a process before become fabric. The seven largest producers in the world are China, India, United States, Brazil, Uzbekistan, and Turkey. The cotton processing starts with picking the bolls, ginning them to separate the fibers from the seeds converting to lint. The lint is pressed into bales and shipped to the spinning mills (Hatch, Kathryn L.). The first step when arriving to the spinning mill is called opening, cleaning and cake formation, the point of this is to allow the non lint material to be more easily extracted from the fiber. The bales are fed into a hopper that mechanically picks the fiber tufts apart. Then the opened fiber is fed to mechanical cleaners that open the fiber even more. In reality the non-lint material is never 100% removed; cotton is then wet out and packed into large cakes (literally), then thrown into the keir, a large vessel (“Raw Cotton Processing | Barnhardt Cotton Manufacturing Company.” ). After it goes on to scouring, adding a new raw material, sodium hydroxide is pumped into the kier. During this time the heat, pressure and alkali solution is applied to the cakes, the waxes on the fiber are converted into water soluble soaps. The remaining plant matter is softened, the pectins and other non-cellulosic materials are suspended to be washed away. There is a final rinse with water for a complete souring (“Raw Cotton Processing | Barnhardt Cotton Manufacturing Company.” ). A fiber finish is added to allow efficient processing on high production web-forming equipment. There are different finish solutions depending on application need, once that’s done the solution is drained and the wet cakes are re-opened into tufts of fiber to dry. Once the moisture level is measured we are done processing coton. Cotton is soft because of it’s naturally end-taper, high in absorbency, and stronger when it’s wet (“Raw Cotton Processing | Barnhardt Cotton Manufacturing Company.” , Hatch, Kathryn L). Wood pulp has been around since the 2nd century in China, being mainly used for papermaking. It wasn’t until the 13th century that pulp spread to Europe beginning to be used for the production of other products. We get wood pulp from softwood trees: spruce, pine, fir, larch and Hardwood trees such as eucalyptus, aspen and birch. Our goal is to break down the bulk structure of the fiber source, chips, stems or other plant fibers, into the fiber component (Hatch, Kathryn L. , “Pulp (Paper).”). The first step is when wood chips or other plant fiber source are created into a thick fiberboard which can be shipped to a paper mill for further processing. Then the wood chips are chemically cooked in the presence of sodium hydroxide and sulfide liquor under pressure.This removes the lignin, a polymer that binds the cellulose fibres together, and separates the wood into cellulose fibres. During the cooking process, approximately half of the wood dissolves. The pulp is then washed, screened for quality and may be either bleached or unbleached, depending on the customer requirements (upmdotcom. , “How is pulp made?”). Viscose rayon is created when wood pulp in a sheet form is chemically converted to a viscose solution, then through the wet spinning process is converted to solid 100% cellulose. The cellulose from wood is dipped in a sodium hydroxide solution to be swelled and converted to alkali cellulose. Afterwards, aging the pulp is required to make the cellulose chains degrade to smaller molecules which can dissolve later. There is a reaction with carbon disulfide to form cellulose xanthate that then dissolves when dipped in sodium hydroxide to make viscose spinning solution. Lastly, ripening reaches appropriate viscosity and wet spinning process begins. Viscose rayon is soft, limp, has a high moisture regain and absorbency (Hatch, Kathryn L.). In the production of disposable wipes, there are synthetic oils like polyester and polypropylene added to create a higher quality. Polyester is a polymer composed of at least 85% by weight of ester functional group; the specific material is called polyethylene terephthalate (PET). Terylene was the first polyester produced in England and then brought to the U.S in 1951 by Dupont; It is also the most widely used synthetic fiber in the world. For polypropylene, also known as olefin, the substance is any long-chain polymer composed of at least 85% by weight of ethylene, propylene, or olefin units. In 1957, Italy begun producing polypropylene until 1960 the U.S joined (Hatch, Kathryn L , “Olefin fiber.” ). As I mentioned earlier there are wipes for all different purposes, for the wet disposable wipes the popular added chemicals are glycol, phenoxyethanol, and glycerin. Glycol is a very board chemical, it can be used as a coolant that is used in heat transfer and cooling transfer or can be any of a group of alcohols containing two hydroxyl groups (“Glycol.”). Phenoxyethanol is created by treating phenol with ethylene oxide in an alkaline medium which all reacts to form a pH-balanced ingredient. It is s used as a preservative in cosmetic products and also as a stabilizer. It fights bacteria in personal care products made with a lot of water and variety of nutrients. Glycerin is an organic compound traditionally made from vegetable fat; it can also be petrol-derived. The complex method creating it synthetically is through the extraction of hydrolysis, processed and purified. Like I described earlier the different manufacturing process for each raw material, they all go through different stages that require additional raw materials. Another stage that we considered was the distribution and transportation of these wipes; for every shipment diesel to power trucks or fuel to power airplanes is being used. On average a truck fuel tank holds 125 to 300 gallons and only travels six miles per gallon(“How many gallons does a semi truck hold?”). While an airplane, specifically an Boeing 747, carries 48,445 gallons of fuel and burns 5,000 pounds (750 gallons) an hour (Cox, John, Diaz, Jesus). As we can start to understand very large amount of raw materials are being used to transport all different kinds of wipes, but one thing we can be proud of is the recycling aspect of creating wipes. Because these non woven fabrics are made of cellulose fibers that means wipes can be recycled depending on the chemicals it had. In modern time, when creating wipes we have a certain percentage of recycled fabrics and oil based materials that are used (“Wet wipe.”). It is based upon the strength of the material and its use. This system is great, but can be improved upon so we can create more efficient wipes without having end up in the landfills. The last category our group researched was waste management, which does not have many raw materials added. The only raw material used is gasoline to transport trash including wipes, from our homes to the landfill. This research project opened my eyes to how a little wipes can significantly affect our environment. For our comfort we chose to buy these unnecessary products that are slowing impacting our resources that humanity needs. “How many gallons does a semi truck hold?” Enrodaje.net, 13 Mar. 2017, enrodaje.net/how-many-gallons-does-a-semi-truck-hold/. Cox, John. “Ask the Captain: Reader questions about the Boeing 737.” USA Today, Gannett Satellite Information Network, 12 Oct. 2014, www.usatoday.com/story/travel/columnist/cox/2014/10/12/boeing-737/17036931/. Diaz, Jesus. “These Guys Got Inside the Fuel Tank Labyrinth of a 747 Jumbo Plane.” Gizmodo, Gizmodo.com, 23 July 2012, gizmodo.com/5928237/these-guys-got-inside-the-fuel-tank-labyrinth-of-a-747-jumbo-plane. Hatch, Kathryn L. Textile science. Tailored Text Custom Publishing, 2006. “How is pulp made?” What is pulp? | UPM Pulp, www.upmpulp.com/materials-for-pulp-products/what-is-pulp/Pages/Default.aspx. “Love Wipes As Much As We DO?” Nonwovens Industry Magazine - News, Markets & Analysis for the Nonwovens Industry, www.nonwovens-industry.com/contents/view_videos/2015-06-12/love-wipes-as-much-as-we-do/. “Makeup Remover Cleansing Towelettes.” Makeup Remover Facial Cleansing Towelettes | Neutrogena®, www.neutrogena.com/skin/makeup-remover-cleansing-towelettes/6805100XX.html?utm_source=google&utm_medium=cpc&utm_campaign=Cleansing - Unbranded - Recruit - Makeup Remover&utm_content=Makeup Remover - Wipes&utm_term=make up wipes&gclid=CPnlgP6WkNkCFc4EfwodkuACMQ. “Nu-Pore Makeup Remover Towelettes 25ct (6 Per Case).” Personal Care Works, www.personalcareworks.com/Nu-Pore-Make-up-Remover-Towelettes-6-Per-Case.html#.WnkWF2aZOCQ. “Olefin fiber.” Wikipedia, Wikimedia Foundation, 28 Feb. 2018, en.wikipedia.org/wiki/Olefin_fiber. “Pulp (Paper).” Wikipedia, Wikimedia Foundation, 6 Mar. 2018, en.wikipedia.org/wiki/Pulp_(paper). “Raw Cotton Processing | Barnhardt Cotton Manufacturing Company.” Barnhardt Purified Cotton, www.barnhardtcotton.net/technology/cotton-processing/. As an avid skin care enthusiast, using disposable wipes (also widely known as wet wipes) has been a huge part of my daily skin care routine. The idea of wet wipes was first introduced in the mid 1950’s for the convenience of people who are traveling and needs a way to clean up on the go. It was not until the late 70s that the wet wipes were commercialized and made available to the market. Disposable wipes are made from non-woven fabrics that are saturated with water and gentle cleansing ingredients. Waste water companies refer to the wet wipes as “fatbergs. When flushed down the toilet, wet wipes are the primary contributor to sewer systems being blocked because of their failure to breakdown. As the world industrialized and technology matured, by the 1990s, a large number of supermarket chains started selling their own brands of wet wipes. While they are quick and convenient, we are usually unaware of what happens to the product after we dispose them. For this reason, my group decided to investigate the life cycle of disposable wipes and its different properties. Specifically, this paper will be focusing on the waste emissions that it produces from its raw materials, manufacturing process, its transportation and distribution, and to its disposal. Ultimately, this paper will analyze the life cycle of wet wipes and how it plays a role in the environment, and most importantly, to human and animal health. Wet wipes are designed differently depending on the task that is intended to be used for (e.g. skincare, household, industrial). Choosing the fabric is one of the most important components when making wet wipes since it is the basis for durability, cost and absorbency. The primary raw material for wet wipes is cotton. Cotton is widely cultivated throughout the world. Countries such as China, India, the United States, Pakistan, Brazil, Uzbekistan, and Turkey are few of the top cotton producing countries in the world. Cotton plantations require certain living conditions, such as warm temperature and exhaustive use of water; approximately about 20,000 liters is consumed to produce one kilogram of cotton (World Wildlife). This leads to serious water scarcity problems especially in sensitive regions. Cotton are mostly grown in fields and massive expansions leads to severely depleted and degraded soil in many areas and to the destruction of many habitats for animals. In addition, cultivating cotton is responsible for about 25% of all chemical pesticides used on American crops (How Products are Made). Since cotton plantations attract many pests, such as boll weevil, strong chemicals are used to keep pests under control. There are several threats that pest control introduces to the environment, such as wildlife poisoning, and soil degradation from the chemicals used. Some of the chemicals used remain in the soil for extended time after the cotton has been harvested and no longer grown. Application of substantial fertilizers and pesticides destroys the quality of the soil and water and inflicts threats to the health of the people. Run off pesticides, fertilizers and minerals from cotton fields also contaminates nearby bodies of water such as rivers, and ocean and harms the organisms that are living in it. Another primary raw material in making wet wipes is wood pulp (Sahu, 2012). Wood pulp is a fibrous material prepared either chemically or mechanically, by separating cellulose fibers from fiber crops. Wood pulp is the primary raw material for the wet laid process in making wet wipes. The wet laid process is usually implemented for softer cloths such as makeup wipes or baby wipes. This process uses high consumption of water and other chemicals which contributes to the production of sulfur dioxide and nitric oxide emissions. When these chemicals are exposed with air, it produces sulfuric acid, which is the main component for acid rain, and may cause deforestation. Since wood pulp is derived from natural forests, it produces carbon dioxide emission due to burning or decomposing of wood. The cultivation of wood pulp also generates water pollution. This includes toxic chlorine compounds like dioxins, sulfur dioxide that contributes to lake acidification, air-polluting nitrogenous compounds and phosphates that accelerates algae growth (World Wildlife). In general, unsustainable logging to supply several wood pulp industries boosts climate change and leads to wildlife catastrophe. Polyester is also one of the main raw materials for wet wipes. It is by far the most common fiber used in producing industrial wipes. Polyester is made through a chemical reaction involving coal, petroleum, air and water. This carbon-intensive and non-renewable reaction consumes about 70 million barrels of oil annually (Edwards, 2016). Production of polyester involves harmful materials including carcinogens that when emitted to water and air untreated, it can cause a critical environmental damage. Polyester is non- biodegradable which means that it will persist in the environment even if it breaks down eventually. Another important component comes from plant-based cellulose, viscose rayon fibers. Extraction of rayon fibers consist of treating it with certain chemicals such as sodium hydroxide along with carbon disulfide. Production of viscose rayon releases carbon disulfide, which results in several poisoning cases. Most importantly, to provide the cleaning properties that it claims, wet wipes are saturated with water, and some type of gentle cleansing agents such as glycerol. Glycerol is the raw form of glycerin, it is used to preserve the moist feature in wet wipes and prevent premature drying. Glycerol is acquired from animal fat and vegetable oil (Roth, 2017). Waste glycerin contains a reasonable amount of methanol; 10 gallons of fresh waste glycerol may contain three gallons of methanol (The Official Bio Diesel Web Site). When people are exposed to methanol, they may encounter irritation in the eyes, nose and mouth. In worse cases, it may even lead to liver damage and severe abdominal pain which can lead to death. When methanol interacts with air, it evaporates and stays as a vapor for 18 days before it is dissolved completely with water. For manufacturing and processing, most of the waste comes from the factories which release toxic greenhouse gases and carbon dioxide emissions. There are several steps to manufacture wet wipes which demands a lot of energy. The energy usage contributes to carbon dioxide emissions. Intensive water usage is also a factor in manufacturing since the fibers used need to be saturated in water and cleansing agents. Machines used during manufacturing also uses high velocity of air and water steam jets for a powerful and efficient process. There are about 150 million wet wipes produced each year, so as the demand for wet wipes increases, production and waste emissions from these machines in the factories also increases. The transportation and distribution of wet wipes also contributes a fair amount of waste and emissions to the whole process. The whole distribution process of wet wipes relies heavily on fossil fuels, as a result, it also emits an inevitable amount of carbon dioxide in the air. However, some companies are finding alternative ways for a more efficient transportation of goods. Some well-known wet wipes companies also considered using alternative fuels such as Liquefied Natural Gas (LNG) which produces 11% less carbon dioxide, 95% less particulate matter emissions, and 35% less consumption of nitrogen oxide and diesel (Unilever). Trucks that run on LNG also produces 50% less noise pollution and diminishes carbon dioxide emission by 6,000 tons over 3 years. Furthermore, they have also implemented the use of thermal blankets on temperature sensitive shipments which also reduces carbon output by 927 tons. In general, no matter how wet wipes are distributed, whether it is through trucks, airplanes, trains or ships, they all contribute to GHG emissions and pollution to the environment. When it comes to recycling, depending on the strength of the fabric and its intended use, non-woven fabrics that are used can be partially recycled when it is given the proper treatment needed. Generally speaking, disposable wipes are not intended to be used more than once so they cannot be recycled. On the other hand, polypropylene, the material used for the packaging of wet wipes, can be recycled. They first collect it, then sort it, clean it, and finally reprocess it. Even though it is recyclable, polypropylene has a very short life span and still usually ends in landfills as waste. It degrades slowly, taking approximately 20-30 years to become completely decomposed (Leblanc, 2017). Plastics that are buried down in landfills can leach toxic chemicals into groundwater. As has been noted, wet wipes are not widely recyclable. Many people have embraced the convenience that it offers, however, our huge consumption of disposable wipes produces massive waste. Since synthetic fibers are not capable of degrading, they find their way to bodies of water such as oceans and lakes as environmental pollutants. Even though they are considered as “flushable”, (Murphy, 2016) they do not necessarily disintegrate the same way as toilet papers, this results in drains and sewers being clogged and contaminating oceans and beaches. When they don’t end up in landfills, they remain in the sewer systems and clogs them. Wet wipes have been considered as “fatbergs”, a congealed lump in a sewer system formed by the combination of non-biodegradable solid wastes such wet wipes and oils. Due to the huge amount accumulated in the sewer systems, it creates floods of noxious waste and triggers outbreaks of serious allergies. Wet wipes generate 7.6 billion pounds of garbage each year, making it the third largest consumer item in landfills (Don’t Mess with Mama). Additionally, wet wipes accounts for 2 million tons of plastic packaging per year; 14% of plastic packaging comes from recycling plants, 46% left in the ecosystem, and 40% ends up in landfills (Unilever). Even though wet wipes are labeled with “biodegradable” on their packaging, they typically do not biodegrade in landfills. Over the past few years, our convenience- obsessed era has embraced the notion of using wet wipes for their efficient use, but its long-term impacts to the environment are far too important to be ignored. Their convenience has become quite a problematic matter for our planet. It is ironic how a cleaning tool has become a dirty problem in our society. In conclusion, the life cycle of wet wipes generates a lot of wastes and emissions produced from its raw materials, manufacturing process, its transportation and distribution, and to its disposal. It might not be necessary to completely turn our backs on wet wipes, especially that we have been heavily dependent on it. However, there are alternative ways in which we can reduce our usage. Some ways to manage the usage are removing makeup with a wet wash cloth, washing our hands with soap and water instead, and cleaning surfaces with a reusable cloth instead of disinfecting wipes. Hope, Christopher. “Microbeads ‘to be banned in the household products by the end of next year.” The Telegraph. Telegraph Media Group, 02 Sep 2016. Denham, Jess. “7 Best Biodegradable Face Wipes to Remove Your Makeup.” The Independent. Independent Digital News and Media, 19 Jan 2017. “The Environmental Damages of Cosmetics”. Simple Luxe Living, 17 Mar. 2017. “Daily Mail Online. Associated Newspapers, 23 Mar. 2015. Romain, Alana. “Wet Wipes are a Huge Environmental Problem”. Romper. Romper. 22 Dec. 2017. Kessler, Matt. “Are Wet Wipes wrecking the World’s Sewers?”. The Atlantic. Atlantic Media Company, 14 Oct. 2016. Telegraph Reporters. “Flushable Wet Wipes are Harming Marine Life and Pushing Up Water Bills, Experts Warn”. The telegraph. Telegraph Media Group, 06 Feb 2016. “Cotton”. World Wildlife Fund. WWF. “Cotton”. How Products are Made. “Wipes: What, Where, Why and How?”. Nonwovens Industry Magazine—News, Markets and Analysis for the Nonwovens Industry. “Paper and Pulp Paste”. Hazardous Waste Experts. 02 Jun 2017. “Rayon Recycling”. Home Guides | SF Gates. Fletcher, K. “Polyester Recycling”. Sustainable Fashion and Textile: Design Journeys Earthscan UK. 2008. “The Environment Impacts of Polyester”. Tortoise & Lady Grey. 19 Jun. 2017. “How the Weather Channel Became an Investigative Powerhouse”. Columbia Journalism Review. “Waste Glycerol”. The Official BioDiesel Website. “Wet Wipes 101 – Wet Wipes Manufacturing Process – Part 3”. Rockline Europe. Brind, Mike. The Preservation of Wet Wipes. Step Communications Ltd.
“Those Handy Wet Wipes You Use are Killing the Earth”. Earth911. 08 Nov 2016. “Let’s Talk Wet Wipes and Their Impact on the Environment”. Mommy Emu. 09 Jun 2015. Black, Tracy. “The Dangers of Disposable Baby Wipes”. Don’t Mess with Mama. 15 Jul 2015. “Methylisothiazolinone Definition, Products, and Uses”. The Spruce. Gadberry, Rebecca J. “Ingredient Review: The Safety of Paraben Substitutes”. Skin Inc.
Edwards, Summer. “The Environmental Impacts of Polyester”. Tortoise&LadyGrey. 29 Aug 2016. There is energy all around us. From thermal to kinetic. From chemical to electrical. Through the research for this project I have found many different ways energy is used for disposable wipes. In general wipes go through a long process before they get on the hands of the consumer. From the process of raw materials to the end of its cycle in the landfills. The energy used starts at the plantations and works its way into the factor were they clean the raw material. After all material are clean it is transported to other factories to be turned into a specific shaped for a specific use. This leads to the making of disposable wipes. 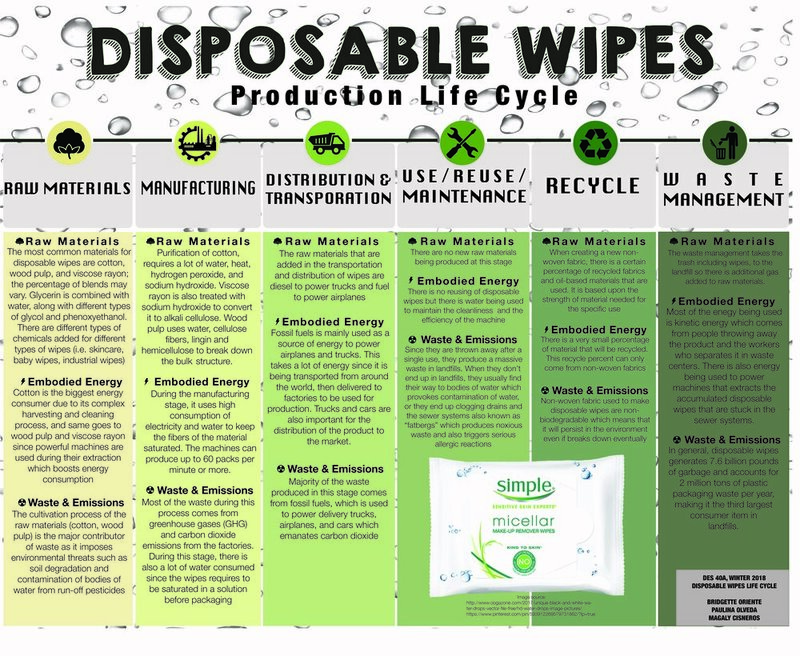 Energy gets used in many aspects in the making of disposable wipes. Its beginning process starts in the plantations. Specifically in the agriculture of cotton, wood pulp and viscose rayon. This is probably the most complicated process and the most time consuming. There are different processes for using each kind of material. In wood pulp the process starts at the tree nursery. This process usually involves kinetic energy, people handling the plants. Most of the energy being used is by people cutting part of the parent plant that will later be use. They use vegetative propagation which is a way to make the the tree later in the process look identical. During this part of the process there people in labs are working to get parts of a parent plant and combining it so later the seed will look identical to the parent plant. Then they are taken to the rooting house. They are kept there until they are 16cm high. They take 16-20 weeks in autumn and winter and 10-12 weeks in spring and summer. They are also kept in an environmental adaptation before taken to its planting location. During just these few steps there is a lot of energy being used already. Kinetic is one but there is also spraying hose, different kind of transportations being used to move the plants. Some are tractors. Later they are evaluated in its growing process. Once the tree is ready to be cut, they will have two ways to start the pulp process. One is the mechanical harvesting method and the other is a traditional chainsaw felling. During this there is kinetic energy being used. You have people working with machines. In the mechanical method there are people using machinery. A truck that cut down the tree and cleans the bark. This uses more energy. There is a tractor that is doing all the work at a fast pace. In Chainsaw felling there are workers with chainsaws doing most of the work. Both methods will most likely be using fuel to operate the tractor and the chainsaw. Kinetic energy is put out by the people working. The timber gets transported to the timber yard and later transported to the mill where pulp is produced. SOme of the energy being use goes to a lot of machines that process the pulp. Starts at a cheaper, then conventional belt, continues to the digester. Temperature and pressure is used in the process. There is a lot of water that gets used for washing and bleaching. A lot of electricity is used to work the dryers where the paper gets dried before sending it to vessels to be transported to different markets around the world. Viscose rayon is another material used for disposable wipes. Its process also involves a lot of energy and time. Viscose rayon raw material is pulp. Most likely one of the vessels ships from a pulp processing factory takes it to a facility that will turn pulp into viscose(KelheimFibres. “The Production of Viscose Fibres at Kelheim Fibres GmbH.”) The first kind of energy being use at the beginning process of viscose would be mechanical and kinetic. This would most likely involve fossil fuel. There are at least twelve machines that are processing the pulp to be made into viscose. A lot of water gets used during this process and in kelheim fibres factory alone puts out 25 trucks that take the ending product of viscose around the world to be turned into a product. In this case a disposable wipes. The most energy consumed fibre is cotton. The cotton process is long and time consuming. Its process stars like pulp and viscose. Using kinetic energy and mechanical. Cotton comes from cotton plantations. With more technology access there is less energy being put out by a worker and instead a machinery will do the work faster but using more energy. Most of the machines being used in the cotton plantation process use fossil fuel. There is kinetic energy being put out from workers driving the tractors but it still doesn’t compare to the work being put out by machinery with faster technology. Cotton use to be very labor intensive but now most cotton farms use state of the art machinery(utiacomm. “The Story of Cotton.”) Most cotton fields are around three hundred to seven hundred acres big. The way cotton grown is it has to be grown in warm enough land. This kind of thermal energy will help the plant grow. During just the harvesting process a lot of energy can be use. There is some kenatic but most of it is fuel source energy. Before machinery was use and cotton was picked by hand, farmers would pick out two hundred pounds by hand. Now with so much technology and machinery, cotton picker can pick up around two hundred pounds in ninety seconds. This pickers are fuel with fossil fuel. A cotton picker has a five hundred horse power with possibly a 13.5 L engine. They pick up the cotton and with a stream of air Some seeds get cleaned out. Once the picker picks up the cotton, the cotton gets put into a bool buggy. From the boll buggy it gets put into a module builder. This builder can hold up to twenty thousands pounds of cotton. They are molded and out into another truck that will be taking it to a local gin. In some farms where cotton gets processed around seven machines get used to clean up. Some will be used for oil, food for animals, or textiles. Cotton will then be transported to a textile factory or a product factory. This is just a small version of the energy used to process of some of the raw material. The process is usually longer and more complex. After all the raw materials have been transported to facilities to be turned into the wipe material, then the material to make wipes gets transported to a factory where the wipes will be made, packaged and shipped to store for the consumer to purchase. This process uses a lot of electricity and fossil fuel. Once the material gets to the facility it goes into a machine that produces the wipes. There are different kinds of machines for the making of wipes but they all have a similar concept. They are mostly all electricity based. This wipe making machines can be purchased in Asia. The DaChang machinery is one of many. These wipe making machines have at least three different machines working at high speed within one machine. They usually have a clase were the fabric fibers get saturated. A lot of water is used to clean the machines as well. They also have blades that cut the fabric in a size that will fit the specific size. DaChang machines are a high speed. They can produce around sixty packets or more of wipes per minute. This is a fast production line(“DaChang Machinery DCW4800-24+KGT 340B High Speed Wet Wipe Making Machine” ). In some cases machinery won’t have a part where plastic lids are glued so they most likely will be done by hand. This adds some kinetic energy. Depending on the company they will have people on the line inspecting the package, making sure it was done properly or they will be adding lids if needed. Fossil fuel is it main source that is being used in the transportation of the product. Airplanes, trucks, cars are the mobiles being used. Since some of the machinery being sold to make wipes is in Asia it needs to get shipped to the wipe facility. A Boeing 747 jet uses 140 megawatts. This is just a possible example that could be used. Cargo trucks or just regular shipping trucks are used to transport shipments. Large trucks being used for transportation of materials. A smaller truck would be used for taking the product to the market form the production facility. The energy used would depend on the distance that the product would be traveling. The last form of transportation would be vehicles. This goes unnoticed but the energy being used by cars and the kinetic energy also counts. Consumer need a form of transportation to go and buy the product. This action would be kinetic energy. There is no reusing of a disposable wipe but there is a very small percent that gets recycle. This percent can only come from non woven fabrics. Moving to the waste part of a disposable wipe. There is also energy that will be used after the disposable wipe gets used. Energy that will be used for the end cycle of a wipe is kinetic and mechanical. For the most part consumer will dispose of their used wipe and throw it away. There are times were the general public doesn’t know that disposable wipes are really not disposable. This wipes will use even more energy. Disposable wipes are not biodegradable and can’t be flushed down the toilet, if done so it later will lead to a bigger problem. Flushing them down will clog the sewers and a specialist will have to bring it’s machinery to dig the wipes out (23ABCnews. “Bakersfield City Sewers Are Getting Clogged Because of Flushable Wipes.” ) This can be a hard process. The machines that most likely would be used to do this job would be electric. Workers will have to work to get it out and use some force to take them of the machines. There will also be energy put into the landfills. There is special machinery at waste centers that separate the garbage and transport the waste to another facility or even another country. This would go back to the first couple of steps where material gets distributed but not it gets thrown away. In the wipe making process there will always be energy from machinery being used or kinetic energy from a person using that machine. Without energy there would be no disposable wipes available for consumers. Whether it is in a plantation, cleaning out the material or getting the product to the consumer energy plays a huge role in bringing this item to people home. 23ABCnews. “Bakersfield City Sewers Are Getting Clogged Because of Flushable Wipes.” YouTube, YouTube, 24 Sept. 2013, www.youtube.com/watch?v=Ef5FgU0Tx9w. “Cotton Library.” Barnhardt Purified Cotton, www.barnhardtcotton.net/cotton-library/. cosmeticmachines. “Full Automatic Baby Wet Wipes Cutting Folding Lid Packing Machine End Packaging Solution 全自動濕巾折疊包裝線.” YouTube, YouTube, 26 Feb. 2017, www.youtube.com/watch?v=GclaHEUttkY. “DaChang Machinery DCW4800-24+KGT 340B High Speed Wet Wipe Making Machine.” YouTube, YouTube, 27 Aug. 2016, www.youtube.com/watch?v=oiGb8YsGiXQ. Emerald Coast Utilities Authority - Flushable/Disposable Wipes, www.ecua.fl.gov/green/flushabledisposable-wipes. “Featured.” Nonwovens Industry - Nonwovens Industry Magazine - News, Markets & Analysis for the Nonwovens Industry, www.nonwovens-industry.com/. KelheimFibres. “The Production of Viscose Fibres at Kelheim Fibres GmbH.” YouTube, YouTube, 25 Oct. 2017, www.youtube.com/watch?v=14PZNgRoEUM. “Natracare Organic & Natural Feminine Care Products.” Natracare, www.natracare.com/. “US5629081A - Premoistened, Flushable, Disposable and Biodegradable Wet Wipes.” Google Patents, Google, patents.google.com/patent/US5629081A/en. utiacomm. “The Story of Cotton.” YouTube, YouTube, 24 May 2011, www.youtube.com/watch?v=AAUQNMldp_Y.